As the first clinic in Austria with the treatment focus on rejuvenation, regeneration, and optimization of the body DDr. 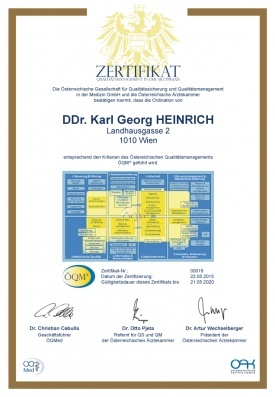 Karl-Georg Heinrich received the ÖQM® Quality Seal for the outstanding organization of his clinic. 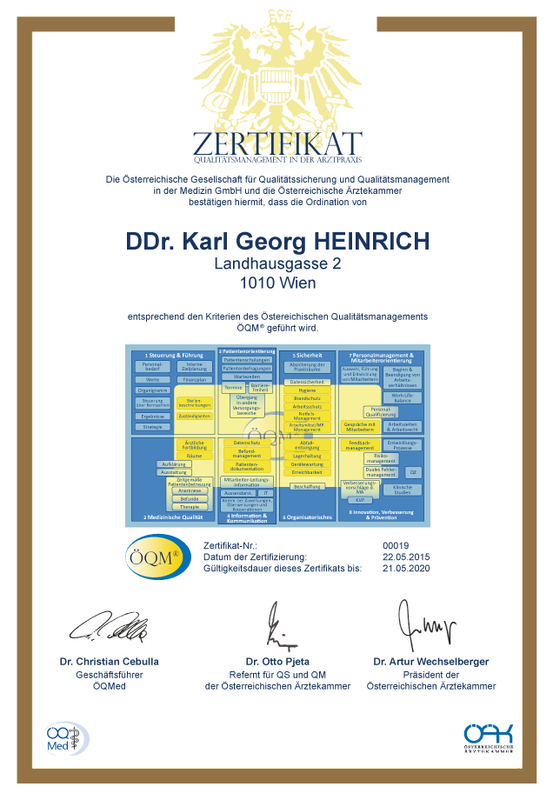 ÖQM® stands for Austrian Quality Management System (Österreichisches Qualitätsmanagementsystem) and was developed on behalf of the Austrian Medical Association. The thorough implementation of the holistic management concept of ÖQM® guarantees are that internal structures, the contact to the patient, and all interfaces to external partners are organized, reviewed, and improved in a quality-oriented way. Your well-being is our top priority. With proper care, precision, and diligence, we thank you for your confidence in our medical expertise.